I am by no means a DIY girl nor is this really a DIY design blog. I did DIY for years when I had to, but I never really liked it. (My husband used to joke that I “may not have expensive taste, but very particular taste.” Now my taste is a little more expensive, too — hahaha, sobsobsob.) Nowadays with 2 super busy kids, limited time for my poor husband, a house and yard, and my own business, too little time for exercise and music, DIY is almost never in the cards. I just wait and save. Why would I DIY now? 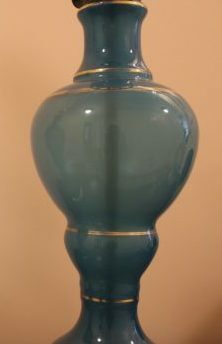 Well, as a part of the lighting plan for my One Room Challenge foyer, I had a gorgeous vintage blue opaline lamp (I have two, but I’m only using one for this project) that had been converted from gas to electric eons ago. The result was an ugly pipe going through the middle of it, disrupting the beautiful glowy blue glass. I wanted it GONE. So I thought, “Easy peasy. I’ll French wire it.” Some of you may be saying, “Of course!,” and the rest of you are scratching your heads and looking at me (hypothetically, of course) as if I had two. Let me explain. French wired lamps are nothing new in design; they were very common a century ago. It is a type of lamp where the cord comes directly from the socket rather than having the wire pass through the lamp’s vase and out the bottom. 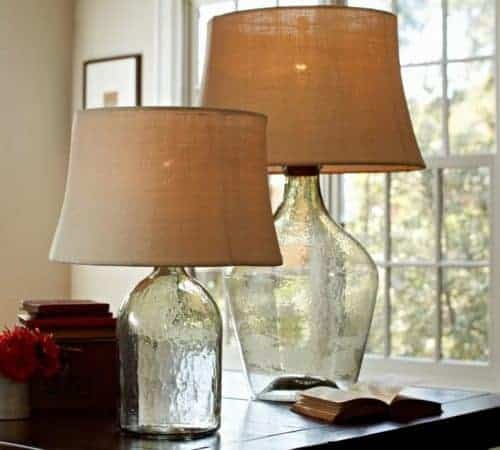 You can find them aplenty on the web — especially on lamps with opaque or crystal bases where one wouldn’t want to have the beauty disrupted by a metal column. Makes a big difference, yes? French wiring is also handy if you want to make a lamp from a vase or bottle and you don’t want to drill a hole in the bottom. For example, if you picked up a beautiful pair of Chinese vases at auction and wanted to maintain their integrity. It’s just a matter of semantics. The thing I realized is that design speak is not the same as lamp-maker speak (unless you happen to be an upscale lamp shop that works with a lot of designers — not really where I was shopping, being in small town NH and interested in DIY stuff this time around). After probably 5 calls — including local lighting stores — I looked at the contact info for The Lamp Shop, one of the more prominent online parts distributers, and I saw that, lo and behold, it was located in Concord, New Hampshire. I thought I knew every home-type of store within a 30 mile radius. How did this place go below my notice? No hours were listed, but I called them up and asked if I could visit in person, and away I went. This is the Olivander’s of lamp shops, my friends. The Lamp Shop is actually a 75-year-old business, is third generation owned, and has parts dating back 100+ years — and like Olivander the Wand Maker, only the owners know where to find things. I brought my French wiring question to the owner — and immediately she said, “Oh, you just need a side-out.” Whaa? See the hole for the cord to come out? Then I epoxied it to the top of my lamp base. For the best assembly instructions I found on the web, see here. Total cost: $19.41. I epoxied the whole thing to a clear acrylic base, which I found at Zadai Studio. 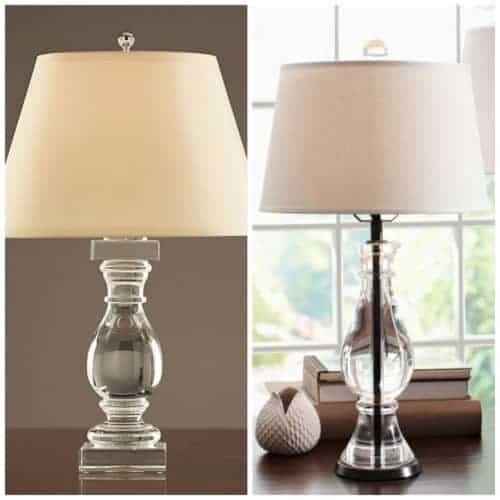 No, they are not cheap, but they really elevate a lamp, no pun intended. Lastly, if you are putting your new lamp on a base as I did, especially if it’s clear like mine, make sure that you get a solid base — not one with a hole (where the cord would typically come out). Add harp and shade. Look at my lovely lamp! I’m kind of obsessed. P.S. Starting this winter, I will be the regular Home writer for both New Hampshire Magazine and Around Concord Magazine (quarterly). Look for me on a newsstand near you soon! Near you in New Hampshire, that is. P.P.S. Not many people seemed interested in my favorite auction finds from a couple of weeks ago, so I don’t think I’ll be making a series of it. More finds for me! However, for those of you interested to see what *steals* you missed, I updated the post with gavel prices here. A couple went higher, some went way lower. Better luck next time!